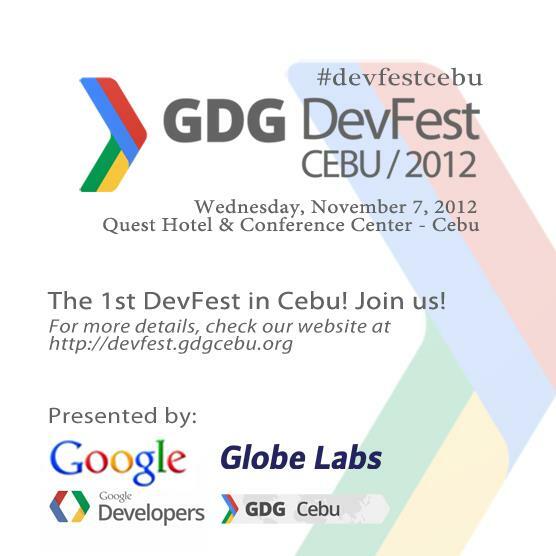 Home News Telecoms Globe Labs foster tech ecosystem in Visayas with Google Developers Group (GDG) DevFest 2012! Globe Labs foster tech ecosystem in Visayas with Google Developers Group (GDG) DevFest 2012! Globe Labs, the dynamic and innovative developer community of Globe Telecom, is bringing the latest technologies to Cebu and Bacolod through the first ever GDG DevFest in the region with the help of the Google Developers Group - Philippines (GDG-PH). Sessions for both cities include topics on HTML5, Android development and Google developer tools, Google Apps, Maps and location-based services, and a showcase from local developers. The business track will focus on Google AdSense and Social Media Marketing. The activity is geared towards web and mobile developers who want to build applications using Google technologies; members of the academe who need to learn how to use Google Apps for online collaboration and global classrooms creation on YouTube; and business owners and content publishers who want to boost website traffic and have effective online marketing. “Globe Labs is always on the lookout for ways to foster innovation and idea generation to help the local IT, particularly the mobile ecosystem. We believe that supporting GDG in this undertaking will be a great avenue for us to further engage the local tech communities. We’ve been working with GDG communities on various activities such as the Global Android Development Challenge, Google Apps Developer Challenge Meetups, PreStartup Weekend Bootcamps and Software Freedom Day. It’s high time, that we bring the DevFests to them. Having the DevFest in Bacolod and Cebu is our way of ending the year with a big hurrah,” said Michelle Santos, Developer Relations Manager of Globe Labs. DevFestBacolod and DevFestCebu will be the largest meetup of locally based Google technology enthusiasts. DevFestBacolod is on November 5 at Sugarland Hotel. DevFestCebu is on November 7 at Quest Hotel. As of July, the Globe Labs community has 3500+ members composed of IT professionals, programmers, designers, analysts, and system Integrators as well as students and business managers. Globe Labs regularly organize or support local groups in their tech events like trainings, workshops, hackathons, and call-for-apps programs.